Ivan R. Dee Publisher, 9781566631655, 192pp. In the thirty-five years after 1890, more than 20 million immigrants came to the United States--a greater number than in any comparable period, before or since. They were often greeted in hostile fashion, a reflection of American nativism that by the 1890s was already well developed. In this analytical narrative, Roger Daniels examines the condition of immigrants, Native Americans, and African Americans during a period of supposed progress for American minorities. He shows that they experienced as much repression as advance. 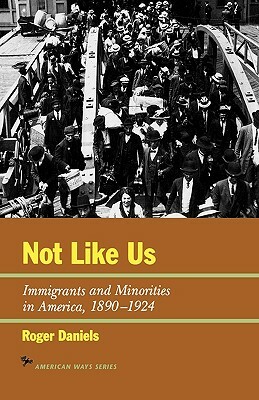 Not Like Us opens by considering the Chinese Exclusion Act of 1882, the hinge on which U.S. immigration policy turned and a symbol of the unfriendly climate toward minorities that would prevail for decades. Mr. Daniels continues the story through the 1890s, the so-called Progressive Era, the opportunities and conflicts arising out of World War I, and the "tribal twenties," when nativism and xenophobia dominated American society. An epilogue points out gains and losses since the 1924 National Origins Act. Throughout Mr. Daniels's focus is on legislation, judicial decisions, mob violence, and the responses of minority groups. The record is scarcely one of unalloyed progress. Roger Daniels is Charles Phelps Taft Professor of History at the University of Cincinnati and president of the Immigration History Society. His other books include The Politics of Prejudice; American Racism; Concentration Camps, USA; Asian Americans; and Prisoners Without Trial.